Chronicles of crafting, categorizing and anything else I find clever. Ok, I know it’s practically summer, but if I don’t make note of my winter composting experiment now, then I’ll never remember. Last fall I was reading GardeningGrrl‘s experience becoming a Master Composter. This is a serious 40-hour course offered by the city. I’m into composting, but I’m more of a pamphlet-read novice. My question is – Can you compost in the winter? GardeningGrrl said she collects compost all winter with an equal amount of leaves, and in the spring it starts to compost. So I took a spare kitchen garbage can (with a lid!) and just threw all my produce scraps in there. It didn’t attract animals or smell because of the lid and it was usually frozen solid. When the snow began to melt, I emptied the bin into my usual compost site and mixed it with the old compost/soil. Then I gave the bin a really good rinse. Since then it has become some really nice compost. 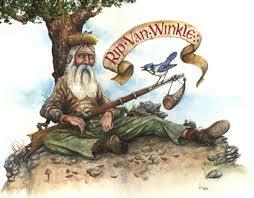 My friend, “Rip”, hasn’t exactly been sleeping for 20 years, but his luddite ways has left him out of the web. On a road trip last year he got lost, so he thought he’d look up the address in a phonebook in a phone booth. He drove around for ages looking for a public phone. Luckily he found a blue police box and a nice doctor helped him find his way. I think it’s about time that Rip adopt the most modern technologies for his next adventures. The irony is that Rip isn’t actually technologically obtuse. He can code in COBOL like nobody’s business. He’s just a really slow adopter when it comes to his personal life. So where should be get started? Do it Tomorrow – After a lot of research into various to do lists – the color coded, deadlines, categories… – this is my favorite, and the simplest. You can either enter it for today or for tomorrow. Anything you don’t get done will be left on the today page. CBC radio – Hey Rip, you can live stream or listen to podcasts of DNTO. Have you got any favorite apps or iPhone tricks? I’ve recently decided to go full Google, and I would recommend that Rip do the same. With one login, on one platform, and with apps that can work together – how can you go wrong? It’s all cloud based, accessible on any computer and on your phone. I started my Google crush with the Calendar. It is the most powerful tool I’ve ever used. The best part is being able to share my calendar with the husband. We are both so busy, it’s hard to keep track of our schedules, and to make time for each other. With Google Calendar not only can I see which night he has free, but I can add an appointment into his calendar to take me on a date. You don’t have to have Gmail to use Google Calendar, but why wouldn’t you? With the same login, you can have this awesome email tool. Google Drive is a cloud storage, file sharing, and collaborative editing tool. 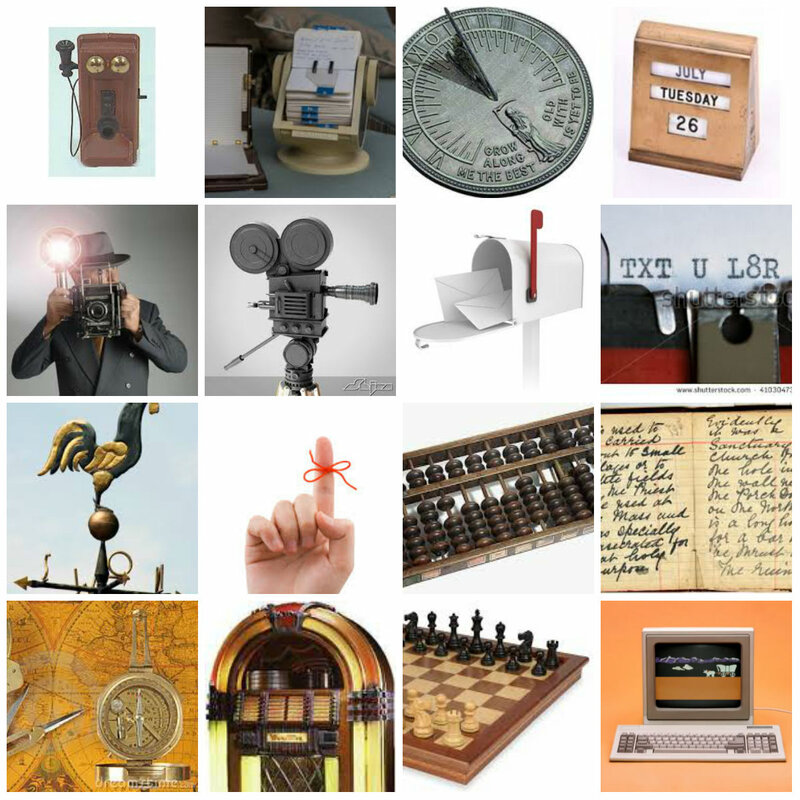 It offers documents, presentations, spreadsheets, forms, and drawing. I have only used docs and spreadsheets, and truthfully, it is not my favorite. I prefer Evernote for note taking and writing. And the spreadsheets function never quite worked properly. But for Rip, I think it’ll work just fine. I have just discovered Google Keep and I love it. It’s basically electronic sticky notes. It’s simple, but you can set titles, color coding, check-able lists and include pictures. It’s a map. It’s online. It has map view, satellite view, and street view. Even Rip knows Google Maps, so I don’t need to sell it here. Google also offers Web, Images, News, Shopping, Videos, Blogs, Books, Visual Search, Travel, Finance. I think that’s a good start for Rip. Any tech, apps or tools you can’t live without? As soon as the snow melts, I’m ready to trade my parkas and boots for shorts and flip flops. This means time for my bi-annual closest swap, which, as an organizing fanatic, is one of my favorite times. This is also a great time to purge my unused/unwanted items and send them off to charity. Only donate items that are clean and in good condition. 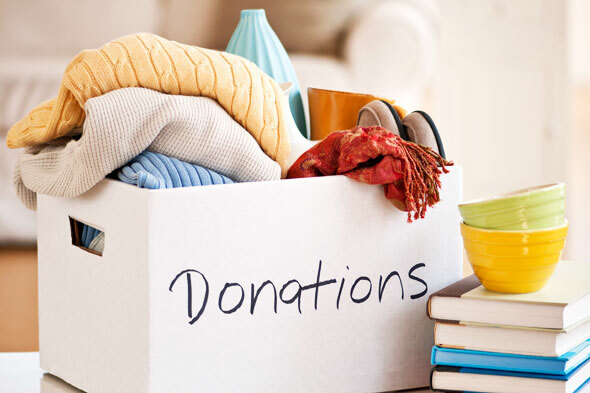 Many charities raise money by selling their items at thrift stores. If you’re thinking it’s in good condition but just needs a small repair, then repair it. If it’s not worth your time, it’s not worth the charity’s either. Check to see what items the charity is accepting. Most charities have a list of acceptable and not acceptable items. Mattresses and large appliances are commonly not accepted. This is where Freecycle or Kijiji can be useful (see below). No one wants your old textbooks. 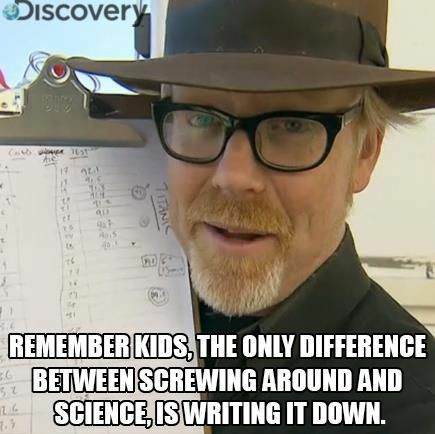 Unless the edition is still be used in schools, your textbooks are worthless. I have done a lot of research on this. The library doesn’t want them, Goodwill doesn’t want them, and developing nations don’t want them (too expensive to ship). Better World Books will take them, if you are willing to pay for the shipping costs. I heard that somewhere they will recycle them into shingles, but I haven’t found a place who will accept them yet. For now, they go into regular paper recycling. Goodwill and Canadian Diabetes’s Clothesline are my favorite places to donate, because it’s easiest on me. They take (almost) EVERYTHING, because they sell it in the store, and they will even pick up from you. For teen or “cool” clothes, I give them to YESS. It’s pretty hard for them to get clothing for their clients. Image you are teenager who has to accept donated clothes. Mom jeans and grandpa’s sweater are not helping. If I do a big purge and have a lot of good condition clothing (like when the husband lost 25 lbs, and he got rid of entire wardrobe), then I’ll give it all to a nearby shelter. Mustard Seed, Bissell Center, and Boyle Street give them directly to their clients. Post a detailed description. The more details the better so you don’t get bothered with email questions. Post a general location. Also to prevent more questions. Only respond to polite, well written inquiries. In my experience, people who respond in “text language” or with poor spelling or grammar are not reliable. Arrange an indirect pick up. This is more for your convenience, but it’ll work for safety too. Once I find a taker, I tell them I’ll leave it at my front door for them after a specified time. Since it’s free, they sometimes flake out, so I don’t want to be waiting around for them. Plus, they are strangers and I don’t need to meet them in my home. The Reuse Center takes all your weird bits. If it can be used for a craft, they will take it. The ReStore (Habitat for Humanity) accepts building materials, books, collectibles, antiques, and artwork. They will pick up large items, and I understand they will even uninstall kitchen cabinets or fixtures. The Eco Station is the last stop. They take your household hazardous waste, anything broken, big, landfill worthy, and recyclables. 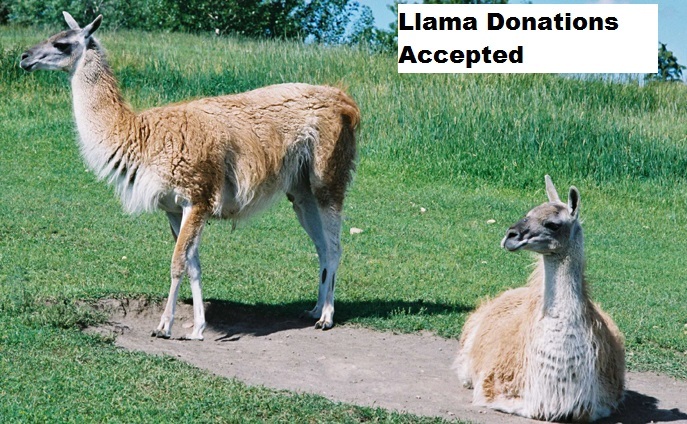 Where to donate my Llama? Not sure who’ll take what? Check the Reuse & Recycle Directory. They can even tell you where to take your llama. No seriously, type llama into the search. Even crafters need a vacation! Especially if they live north of 54° with less 9 hours of sunshine in the bleak mid-winter. 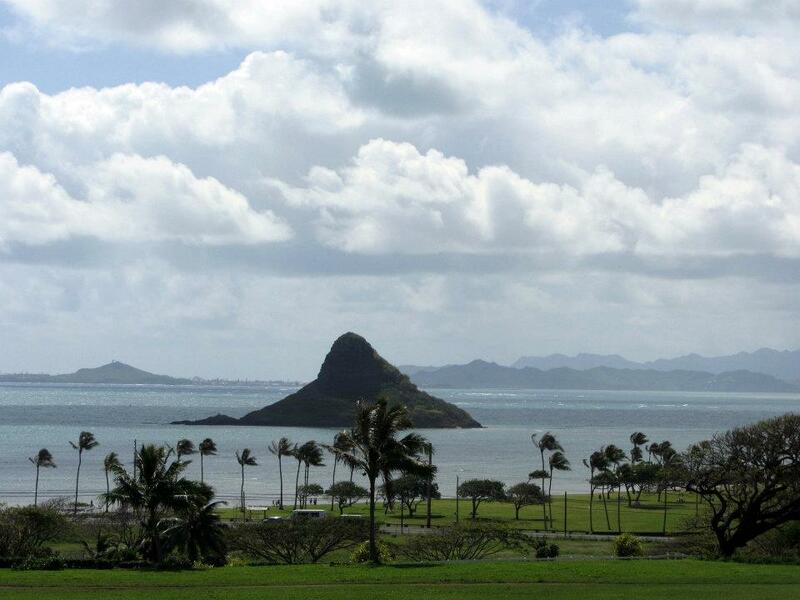 If you ever get a chance to travel to Hawaii, I highly recommend that you go. It’s beautiful. It’s hot. It’s sunny. It’s relaxing. It’s perfect. Onebag is a nice packing resource. He’s an expert ultra-light packer, and gives good advice. He also has macro that lets you plug in the details of your trip and spits out a good packing list. But here’s some of my list. De-planing Outfit – If you take off in -20°C and you land in +25°C, you’ll want a new outfit right away. Pack it on your carry-on and include shoes. Keep in mind, it does “cool down” at night and can rain, so if you land at night a sweater or rain jacket might be useful. I usually make a wardrobe change while we wait for our luggage or our rental car. 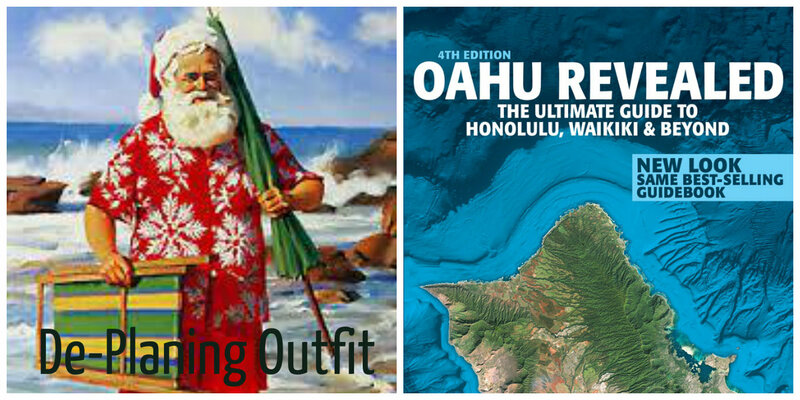 Hawaii Revealed Travel Book – This is the best travel book for the islands. Our friends have used them for three different islands and compared them with other big name travel books, and none come close. They know everything the locals know, they are honest and candid. We have never been steered wrong with this series. Towel – This needs a little thought. You can bring one, or buy a cheap one from everywhere. Maybe you don’t need one because you’re accommodations provide them. But if you have a late departure flight – like after checkout, you’ll want a towel so you can enjoy the last few moments on the beach. Sunscreen and the like – This is something else that needs a little thought. There are a bunch of items that you can buy at home and pack in your luggage, or buy when you get there and lightening your load. Personally I would rather spend my time at the beach than in the store. 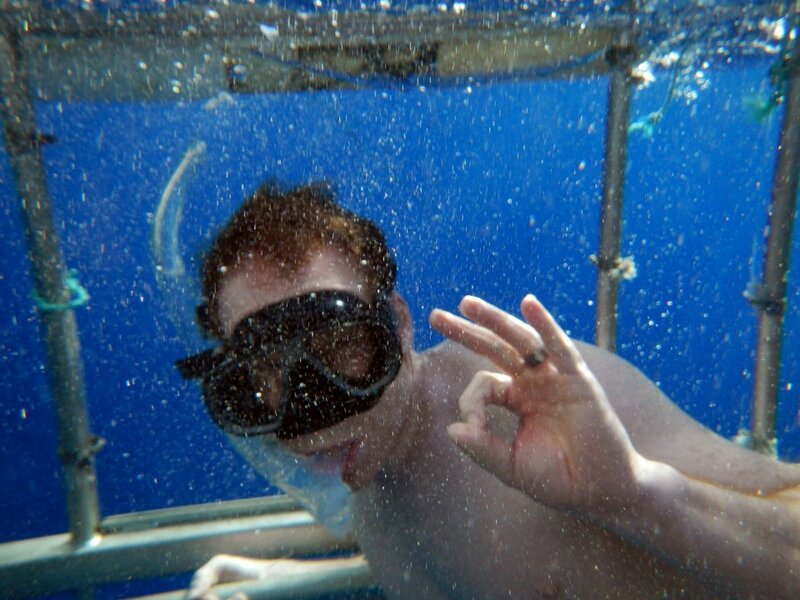 Snorkel Gear – Of course, you can rent, but having your own gear is awesome. It’s nice to know where your snorkel has been. You’ll also save time by avoiding the rental shop. Did you know you can get prescription goggles? For a Mr. Magoo, like me, these are amazing! I can see! And reef shoes can be cheap from Walmart. All this gear may seem bulky, but I found it fits nicely into a suitcase and is well worth it. Hand wipes – Beaches can have the worst bathrooms (if any). I like having clean hands, especially when I’m about to eat. I bring lots of wipes to use many throughout the day, not just a few in case of emergency. 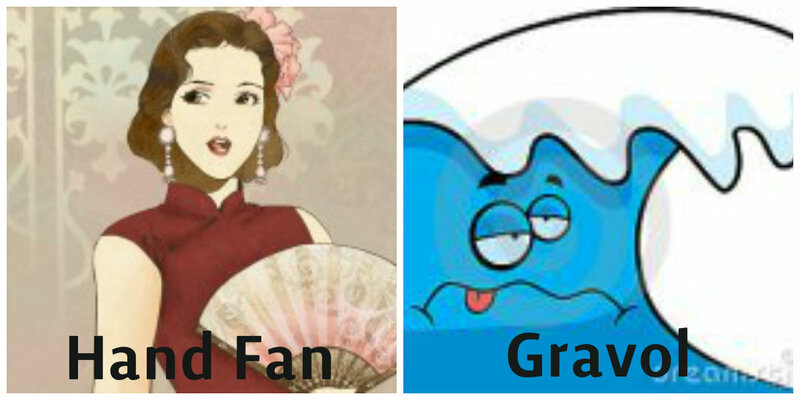 Hand fan – Just an inexpensive fold up fan. I have taken one with me almost every time I travel, and I’m always so glad to have it. Sometimes us Canadians just can’t handle the heat. I’ve used it in Rome, Shanghai, Vienna and Waikiki. It’s small and is very handy. Gravol – Whether or not you are prone to motion sickness, you’re ability to withstand rocking boats and twisty roads could be tested on this vacation. I learned this lesson on a boat ride with my six puking friends. Now I bring Gravol. Reusable grocery bags – Hawaii is very environmentally friendly, and they don’t use (or offer) plastic bags. Since we will be doing our cooking, and therefore grocery shopping, some of your own bags will be useful. When I pack my carry-on, I always keep in mind that my luggage may not arrive or I might get stranded in an airport. Copy of Important Documents – Bring a photocopy of your passport and credit cards in your carry-on. If anything gets lost or stolen, you’ll have copies of them and their numbers to have them replaced. Itinerary, contact information, confirmation numbers, map/directions. – Duh? Be old fashioned and bring a hard copy. Don’t get stuck saying “It’s on my phone, but I don’t have any service.” Also, if you’re renting a car, bring directions to get you from the airport to your hotel. Cash (a little CAD, a little USD) – There’s always some sort of situation where you really need just a little cash at the beginning of your trip; drink on the plane (sometimes they only take cash in a specific currency), snack from a vendor, a bus ticket, to tip the doorman… Don’t be that guy who only has plastic or can’t break a C-note. Comfort – I pack a lot of little things to make my trip more comfortable. This includes, gum, hand lotion, toothbrush and toothpaste, tissue, pain killers, that hand fan from above… They are small but make any trip more comfortable. Granola bars – My favorite travel companion gets very moody when he’s hungry. This usually happens after we have landed but before we make it to the hotel. Granola bars save the day. Ear buds – You’re probably bringing them anyway, but just in case they weren’t on your radar, I know you’d rather have your own ear buds than pay for the airline’s. Cell phone charger – Another small, useful thing that would be annoying to be without. Jewelry – Leave at home! You don’t want to have to worry about it. I once bought a cheap costume jewelry wedding ring, so I could leave the real one at home. One complete outfit – See lost luggage story above. The number one thing to bring on your trip is a smile. My husband advises that you flirt with everyone. This isn’t to say you hit on everyone, it means – be nice, be charming. 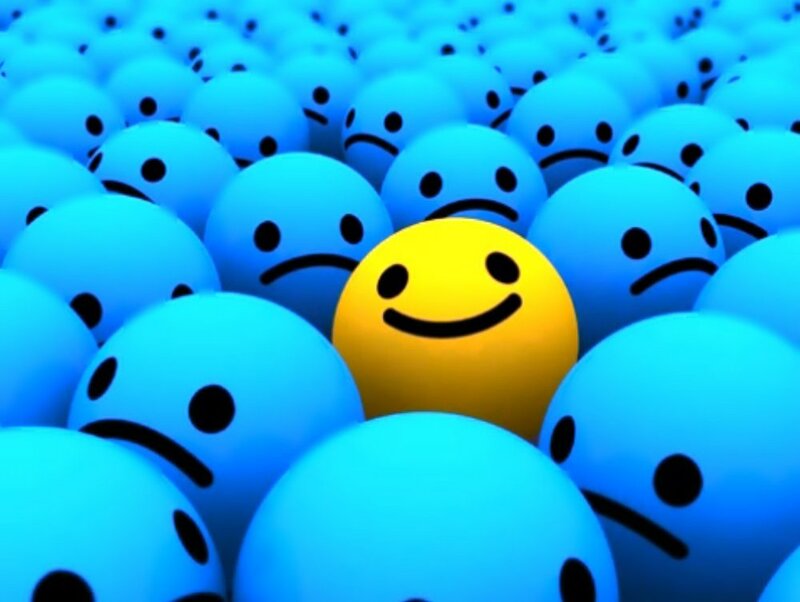 Everything runs smoother with a smile. You’d be surprised (actually, you wouldn’t) how much more helpful people are, especially with deals, upgrades and all round service, with your smile. Well, those are my must-haves for travelling. What are yours? I’m in love with anything ginger right now. I love the hot, spicy flavour. Yum! Here are some of my favorite ginger foods. Chimes Ginger Chews – Original is best, but orange is also really good. These candies are soft and chewy and keep a strong ginger flavor for the whole candy experience. 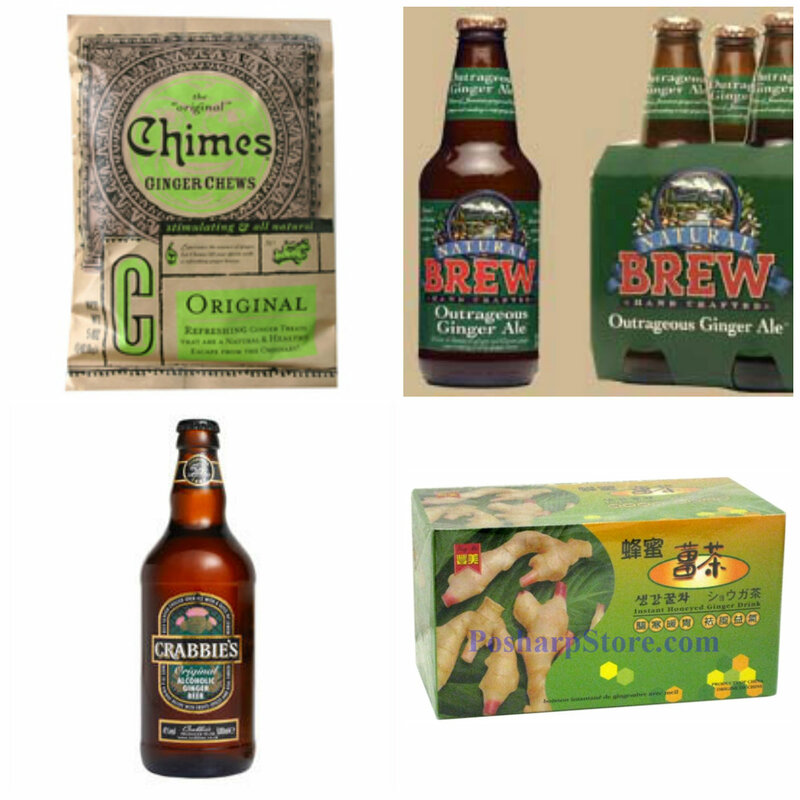 Natural Brew Ginger Ale – A refreshing non-alcoholic drink. Available at some Safeway stores, if you look really hard, it’s usually hiding on the bottom shelf. 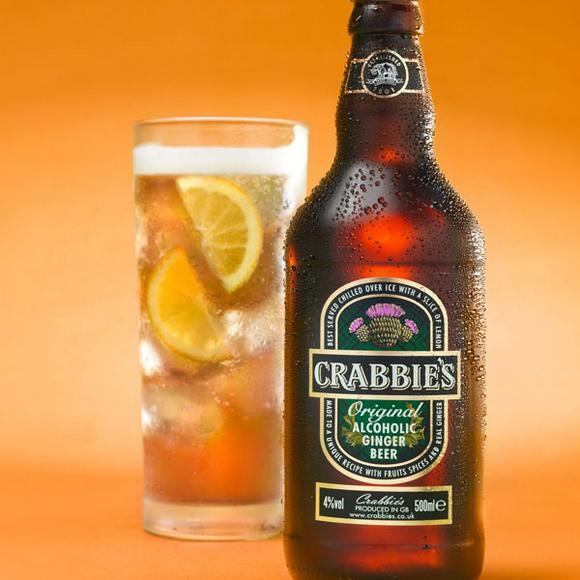 Crabbies Ginger Beer – There are a lot of ginger beers out there, but this is my favorite because it is the spiciest, the most like eating fresh ginger. To fancy it up, serve it chilled, over ice, with a lime wedge. Instant Honeyed Ginger Drink – This is the perfect hot drink to warm you up. It’s also excellent if you have a sore throat or feel like a cold is coming on. You can find this in most Asian groceries, like T&T. I love chocolate! Chocolate in any form. I was spoiled by my parents because at Christmas and on Valentine’s Day we would get Bernard Callebaut chocolates, and they were the most amazing chocolates I ever had. My mom’s favorites are Purdy’s Chocolate covered Gingers (hey another yummy ginger food!). For brownies, you can’t get easier or chocolatier than Ghiradelli’s Brownie Mix. They also make a great hot cocoa mix. When I can’t make it to France for pain-au-chocolat, Duchess Bake Shop and Bon Ton Bakery make pretty good pastries. The very best chocolate is my mom’s birthday cake. It is complete decadence. She puts ganache on each layer, then covers the whole thing with chocolate whipped cream. Heavenly! I have an affinity for anything that holds other things. Boxes, bags, baskets, bins. I love them all. Here are some of the best. Cutlery tray, to tame your junk drawer. Knife tray to keep your blades in order and protect the blades, $17 Rationell Knife Tray from Ikea. Compartment box (or tackle box) – I like to keep all my spares keys in here. It keeps them organized and easy to find. Magazine File for random papers, $3/5 from Ikea. Hanging Storage. I have absolutely no storage at my back door except for a few coat hooks. These hanging pockets are perfect for gloves and toques during the winter and sunglasses and sunscreen in the summer. Notudden from Ikea $10. Laundry Bag (Jall $6 Ikea) or Bag Buddy $13 – I used these for all sorts of things, not just dirty clothes and raking leaves. 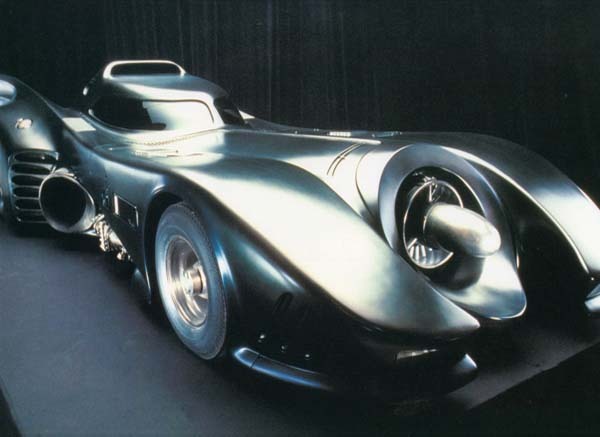 I keep one in the garage for car garbage and another one for pop cans or recycling. Mahogany Wood Memory Box, Bombay Company $99. I have always loved these memory boxes. I keep my most special keepsakes in them. Jewelry Box. The best part of jewelry boxes is the tiny little compartments for each pair of earrings, necklaces or rings. Mine is this amazing cherry red faux-snake skin box with multiple drawers and compartments. Blanket Chest. When I was a little girl my Ngin Ngin (grandma) had a beautiful Chinese chest. It was dark wood and elaborately carved. Garage. My very favorite container is my car house – my garage! I never had a garage until a few years ago and it is the best! It keeps your cars warm and covered, so you don’t have to brush snow off your car anymore. Plus you can keep a whole bunch of other stuff in there too. Awesome! 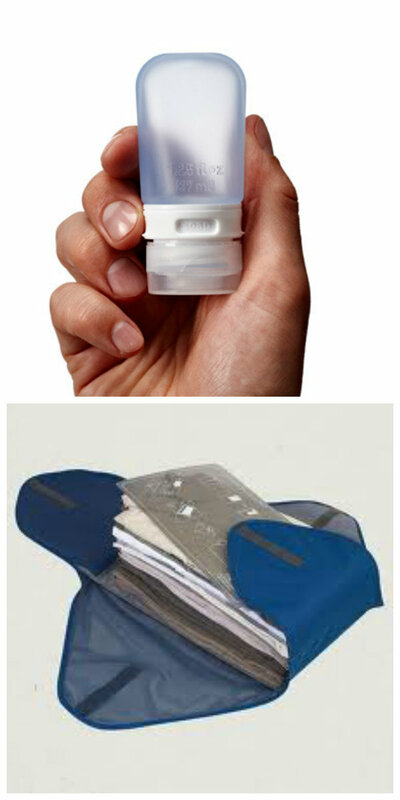 Humangear Gotoob – This is the best travel tube for carrying lotion, soap, or shampoo. $6.75 from MEC. 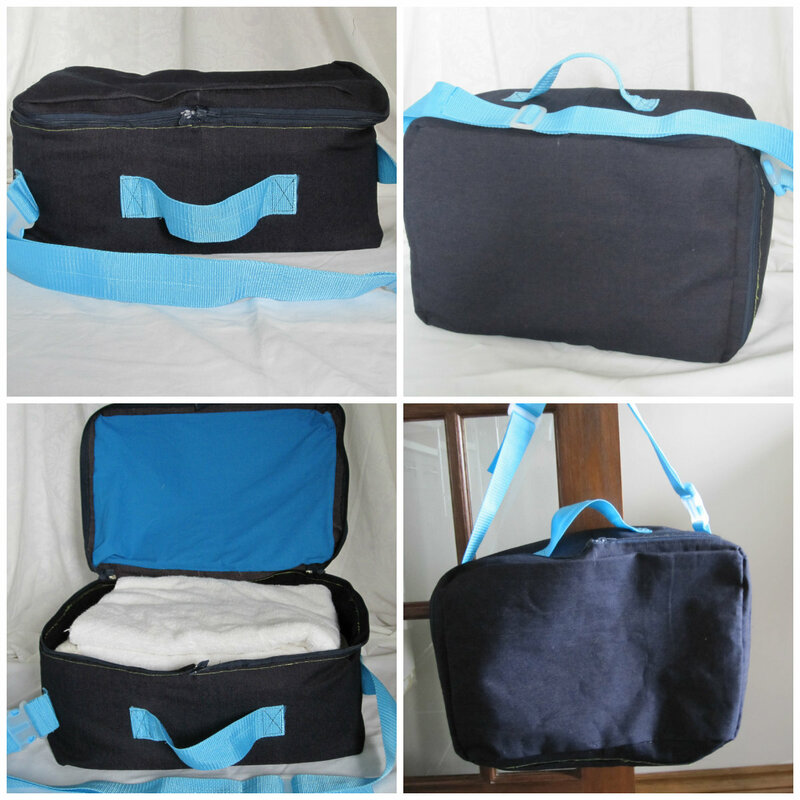 Lug Bags – I have to agree with Rachel’s Favorite Baby Things, these bags are great. They are brilliantly designed, with lots of pockets and zippers, and they come in the most fun candy colors. 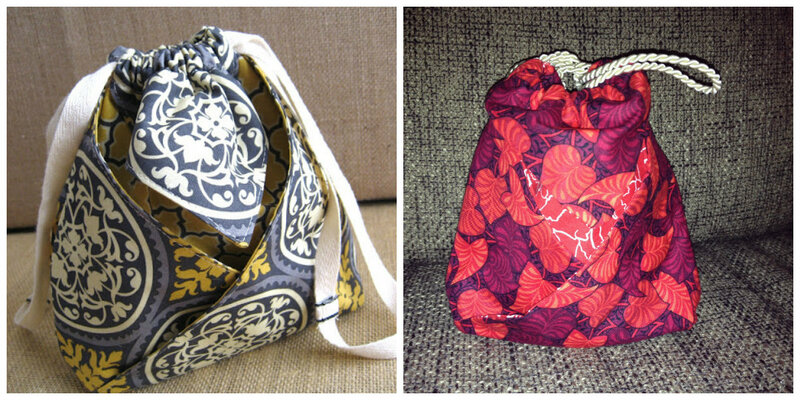 They range in price from $31 for a small purse to $300 for a 4-wheel roller bag. I actually find these bags to expensive at their retail price, so I like to pick them up gently used on kijiji. If the dry winters weren’t bad enough, I get to battle eczema too. I’m no stranger to flaky, itchy skin or dry cracked hands. There are a billion of different creams out there, and after a lot of guess-and-testing and some research I have narrowed down my favorites to three different products. CeraVe Moisturizing Cream is the lightest of the bunch, so it is the favorite for my face. It also BEST rating from Paula Begoun. Glaxal Base and George’s Cream are my other two favorites and they happened to be Canadian. George’s is the richest and greasiest. I like it for my hands, but it leaves lots of fingerprints on my phone. CeraVe $23/453g, Glaxal Base $24/450g, George’s $17/450g. Pedicures are my most favorite way to get pampered. I especially like going to small private nail shops. For $35 I can get a relaxing hour in a massage chair, with a good foot soak, leg message, and I go home with the cutest toes. Anyone who knows me would be shocked to find an author on my list, but less surprised that it’s non-fiction author Malcolm Gladwell. I’ve read most of his books, and every few pages I seem to be blown away by something different. He can change the way you think about things. One great example of this is his article Million Dollar Murphy. Take some time to read this story and you’ll you what I mean. Note: We weren’t paid or perked to name any of these products, they really are just our favorites! I’m not a car-person. At all. Cars are tools to get you from A to B. But they are valuable and expensive tools, so I want to make sure I take care of mine at the best price possible. After heeding Dad’s advice from his post Prepping Your Car for Winter, and getting my oil changed with synthetic oil, the mechanic came back to say that my battery failed and the cabin air filter needed changing. With the help of my car-fiend brother, I changed these myself. Everyone should change their cabin air filter themselves. It’s easier than changing windshield wiper blades and on par with changing a light bulb. FRAM sells cabin air filters at Canadian Tire for about $18. First go to the FRAM website and search their catalog for the part number (for some reason the store didn’t have a catalog). Then look up your manual or online on how to get access to your filter. For my 2003 Corolla, it was ONE SCREW to remove my glove compartment, then pop off the cover, and replace the filter. 5 minutes. The old filter was filthy, and included some leaves and a dead wasp. The Toyota dealership offered to replace it for me for $55. It took me a few minutes and I saved $27. I’m going to have nice clean air in my car and I feel like a car genius! My brother also helped me replace my car battery. It can be done in less than 30 minutes and you can find plenty of step-by-step instruction online. Again, the dealership offered to do this for $185. The battery cost me $100 and I get $15 back when I return the used battery. Doing it myself saved me $100. Not only did I save myself $127, but I got this great feeling of accomplishment, and I can definitely do it again, saving me cash over and over forever! More of Our Favorite Things – In the Kitchen! Thanks to everyone who read the first Favorite Things – In the Kitchen! 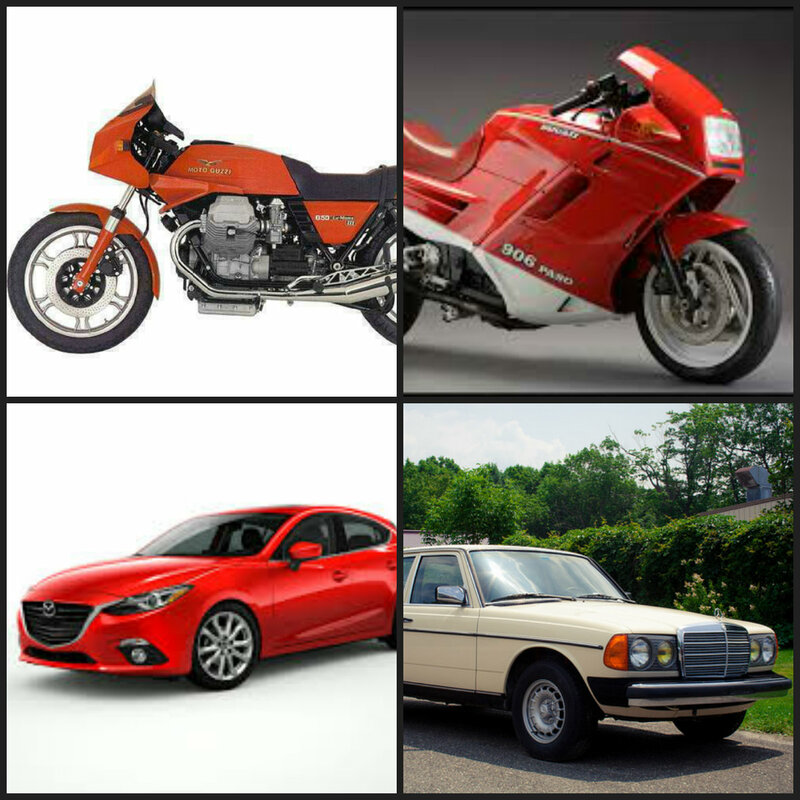 Here are a few of your favorites. Magic Bullet – Michelle. She says she can’t remember the last time she used her blender. I agree, I especially like that you can make a single serve smoothie precisely to your liking. You can often find it on sale for $30 (25% off) at Canadian Tire. Pampered Chef Potato Masher, $11.50 – Michelle. One word. Magical. Soda Stream, about $100 – Pam. This handy device carbonates water. You no longer have to lug heavy drink bottles home, your trash production decreases, you cut down your consumption of pop, and you can enjoy lots of fizzy drinks. I would avoid the Soda Stream flavourings (they don’t taste quite right) and stick to lemon, lime or any other fruit juice. Cusinart 4 cup chopper/grinder, $60 – Debbie. It’s brilliant for chopping onions, jalapenos and herbs. 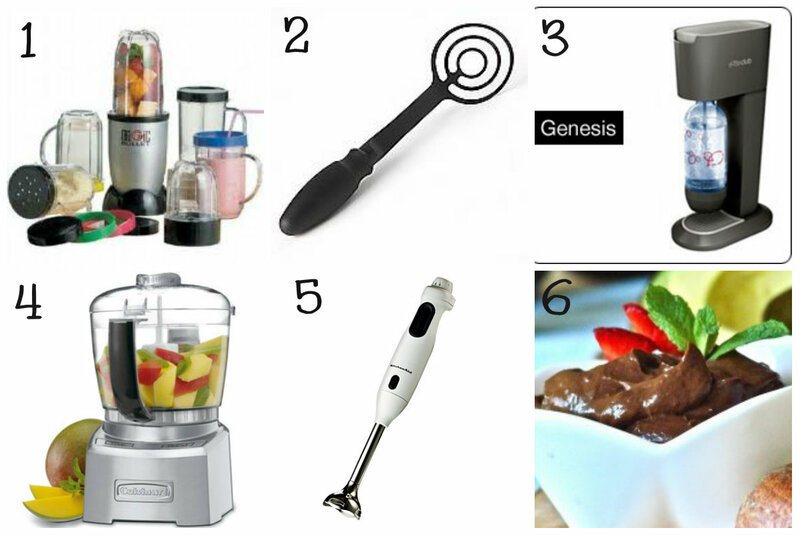 Immersion Blender – Debbie. Great for soup! Chocolate Avocado Pudding – Debbie. What? Chocolate-avocado? This vegan recipe replaces whipped cream with avocado, for a healthy alternative to a rich dessert. Rachel is new mom to brilliant 18 month old Kieran, and here are her favorite baby things. 1) Westcoast baby kimonos – best, best, best invention for 4am diaper changes, promoting skin to skin, and stopping baby from scratching their face off. We give these to all our friends as a new baby gift. Buy from Westcoast Baby or estsy.com,$30. 2) Ergo baby carrier, starting at $115. We have the sport version and have used it from newborn to 18 months and plan to keep going. Keeps baby’s hips supported (rather than dangling the baby over your crotch) and is ergonomically great for parents. You can wear them on your chest, hip, or backpack (our current favorite). While I loved my ring sling my husband would never wear the sling (can’t blame him) so the ergo was a great way for us to both wear baby. 3) Music Together of the Northern Lights classes. If you are looking for classes to give to friends with new babies Music Together rocks. My son lights up whenever he hears the CDs. It has had the ability to calm him from most tantrums and has given us pleasant car rides. We are total sports folks and if I only had one activity to do with my son we would drop swimming, open gym and this would be it. Plus, he now shows great interest in music, instruments and will sing himself to sleep! 4) Dollar store plastic bins. I realize this seems silly but there are a lot of things to organize post baby. I use these inexpensive bins everywhere in the house to keep organized. Bottle parts in the pantry, shoes and socks in the bedroom, jars of baby food in the pantry. 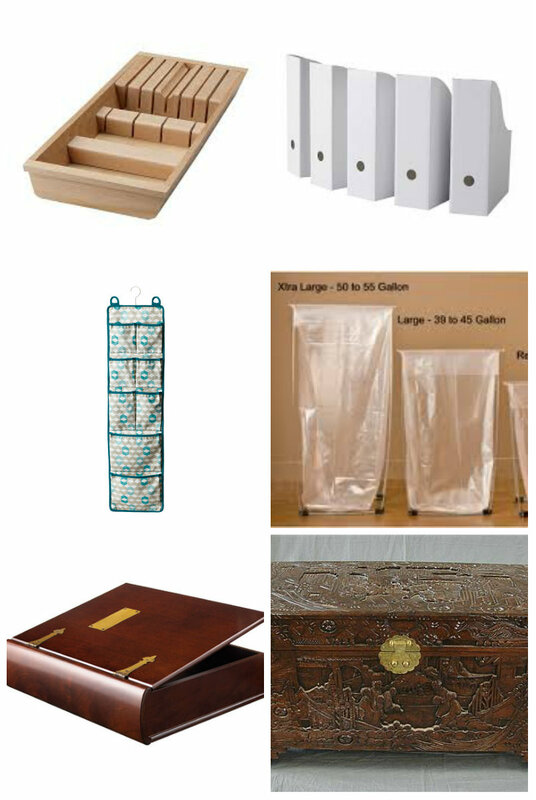 New parents always have a need for storage bins-we got quite a few as gifts and within a few weeks I understood why. 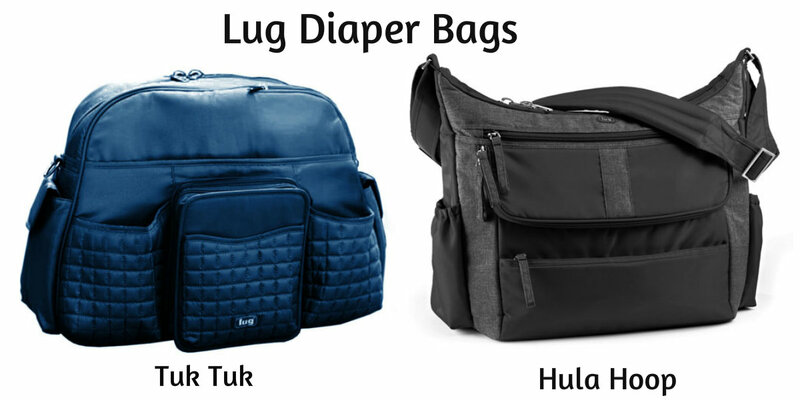 5) Lug diaper bags-tons of pockets waterproof, wipe clean bottom, wet pouch for diaper stuff-couldn’t ask for anything more. We have the Tuk-Tuk ($116) my sister has the Hula Hoop ($106). Dark colors mean that dad will carry the same bag! 6) Mixie Bottle -Yes, breast is best but sometimes life happens and breastfeeding needs to be supplemented with formula. The problem with traditional formula dispensers is you wind up with white powder everywhere when you try to mix a bottle on the go. Being a new mommy and being covered in white powder is not really socially acceptable. The joy of the mixie is no mess and you don’t have to keep it cold. The powdered formula is kept separate from the water so you just push the button and mix away. We tried other mixing bottles and they all leaked and were cumbersome (too big for the diaper bag). Expensive-yes. Worth it if you have to use formula? Heck Ya. Available in Edmonton at West Coast Kids for $20. 7) Aden and Anais muslin swaddle blankets, $50/4 pack. -These are huge so they make swaddling easy but you can also use them as a nursing cover, car seat cover, floor blanket etc. We were given several sets and they have now become my son’s security blanket for sleeping; he loves to drag them around. They wash really well and have never had difficulties getting stains out. Because the blanket is so light we were able to use it as the internal swaddle when he needed to be double swaddled (swaddle the arms and then put the baby in a swaddle bag or pod-also a worthy investment). 8) “Happiest Baby on the Block White Noise” on itunes for $10. Babies like white noise but most baby white noise machines don’t have a volume control and are pretty quiet. This doesn’t work when comforting white noise is as loud as a shower. We discovered these tracks when the only noise that would calm my son was a hairdryer. Running your hairdryer for hours is not safe, hitting repeat on these tracks is worth it. 9) Busy board-see craft ambitions blog. My son has spent happy hours with this. All of his friends love playing with it. All of their parents want one. 10.) Glamour mom nursing tops, starting at $49. These have a built in bra that works for all sizes. They are long so they cover the mummy tummy. This also means that the provide tummy coverage while nursing in public. I used this under cardigans for easy access nursing. 11) Healthy mom=happy baby. I think that exercise is a huge help when coping with all of the changes being a new mom. There are a ton of new mom exercise classes and a chunk of them are going to get you to do things that aren’t great for the post-natal body (running, jumping, crunches-I now know that no one should be doing crunches). It is well worth the investment to get the input of someone who knows what they are doing, or to do your reading in the right places. Check out Jessie Mundell’s blog or online training. This girl knows the needs of new moms! A reader pointed that we missed Tim’s favorite pizza place. Well, here it is! His #1 favorite is Zorba’s in Acheson. They make Chicago-style deep dish pizza. Don’t get there hungry because the thick crust takes 45 minutes to bake. The best way to enjoy Zorba’s pizza is to go on a beautiful summer day, ride your motorcycle the 25 minutes from Edmonton, and then enjoy some delicious, cheesy pizza. Tim’s #1 favorite pizza place in Edmonton (effective November 2013) is at the Italian Center, west end. It’s the exact opposite of Zorba’s – it’s Italian-style thin crust and takes just a few minutes to cook. Tim, who has very sophisticated and discerning tastes, gave me a list of over 50 things that are his “favorite”. Here they are, in no particular order. · Mario Batalli recipes – Bolognese sauce is always a hit. · Slow cooking roasts and pork shoulder. One our favorite dinners of dad’s is his Sensational Pork Roast. · Good coffee; why is it so hard to find? · ‘Boutique’ wristwatches like the Halios Laguna (custom made by cottage industry companies, and sold at a fraction of the price of brand names like Rolex, Omega, and Breitling). Our Favorite Things – In the Kitchen! Rocker Garlic Crusher – cousin Carol. It’s easier to use than a garlic press and easier to clean. She picked it up for $2 at Daiso, a Japanese toonie store, in Richmond BC. Starfrit Slim Glass Kitchen Scale, $20 – Ingrid. The best thing about this scale is its size. It’s the size of adessert plate and so skinny you can store it anywhere. It weighs in imperial or metric. 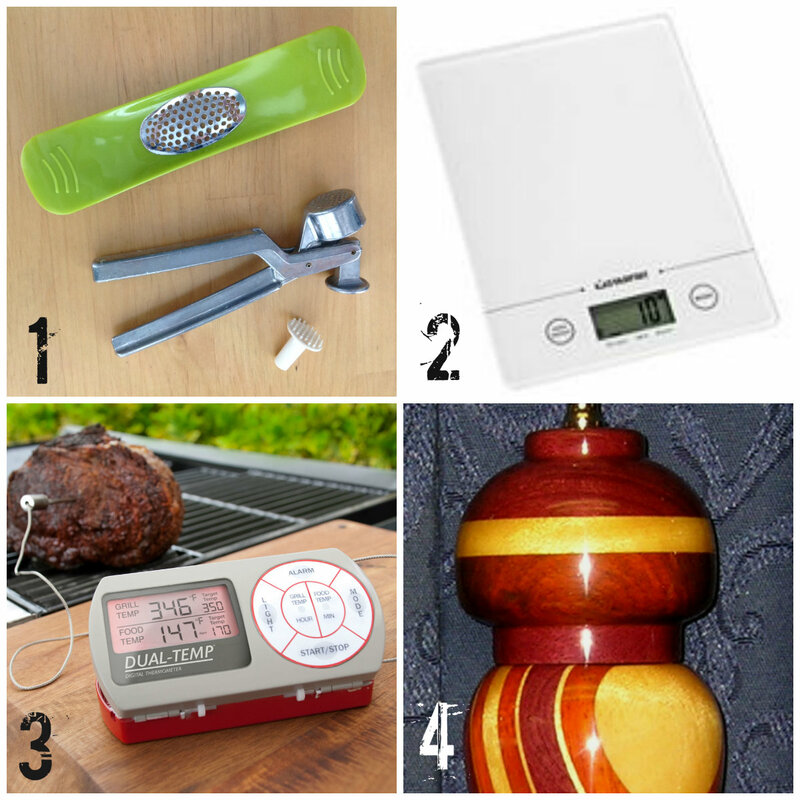 Digital Meat Thermometer – Tim. Dad makes some great roasts and pork shoulder, and this is his secret to the best roast beast. You’ll never have an over cooked meal again. Fresh ground pepper – Tim. I love this item because it’s cheap and makes food taste so much better. You do need a pepper mill, and they range in price. You can get a decent one at most department stores for $20. But if you’d rather spend 10 times that try woodenpeppermills.com. These pepper mills are so beautiful that I can remember them from Sarah Moulton’s cooking show 15 years ago. They are hand crafted and start at $180. Blendtec Blender – Chris. When you start every day with a fresh fruit and veggie smoothie, and you like another smoothie for dessert, you’ll need a serious blender. This restaurant quality blender is pricey at $460 at Costco, but it easily crushes ice and purees anything into a nice smooth texture. Will it blend? Absolutely. Chef’s Knife – Jenn. One good quality knife can change your entire kitchen. I like an 8″ blade and a good steel to keep it sharp. If you’re going to spend the money, you need to take care of it. Hand wash only (the dishwasher flicks around bits of detergent and food, which dulls the blades) and sharpen regularly. Watch Alton Brown explain to you everything you need to know about knives, but didn’t know to ask. Cups get their own category? Yup. I heard about so favorite cups, I had to make its own category. Contigo Travel Coffee Mugs – Jenn. They keep your coffee super hot (Hugh Jackman hot), and they never spill. We love them so much that we use them almost every day, so they only last about two years before they get abused and break. You used to be able to buy two for $40 at Costco in a variety of colours. Beer Steins – Curtis. No red solo cups here, beer is enjoyed from real steins. We have a plethora of steins collected mostly from garage sales. Curtis likes them so much, he drinks his daily water from them. They are almost as nice as his buddy’s Tiffany rock cut beer mugs. Sorry guys, Tiffany no longer sells them. 1960s-era restaurant ‘standard’ clunky coffee mugs from Uncle Johnny’s restaurant – Tim. My favorite thing about this mug is it’s a historical artifact. You can find the matching plates at Chop Suey on the Prairies Exhibit at the Royal Alberta Museum. Cup with Straw – Jenn. Yes, I call it my sippy cup. It’s great that it has a lid, but what I really like is drinking out of a straw. Straws make everything more fun. If you have any favorites you’d like to share, just send me a message! Claire’s friends know that she is a stylish shutterbug who takes delight in anything adorable. So it’s no surprise that she said her favorite things are photography, jewelry, and cutesy things. She’s also a thrifty gal with high-end tastes, so her list has a wonderful range of prices from a few dollars, to the sky. Claire’s gear is the Olympus OM-D E-M5 Digital Camera, and she takes great photos from portraits to landscapes. Here are a few things she’d like to add to her equipment. 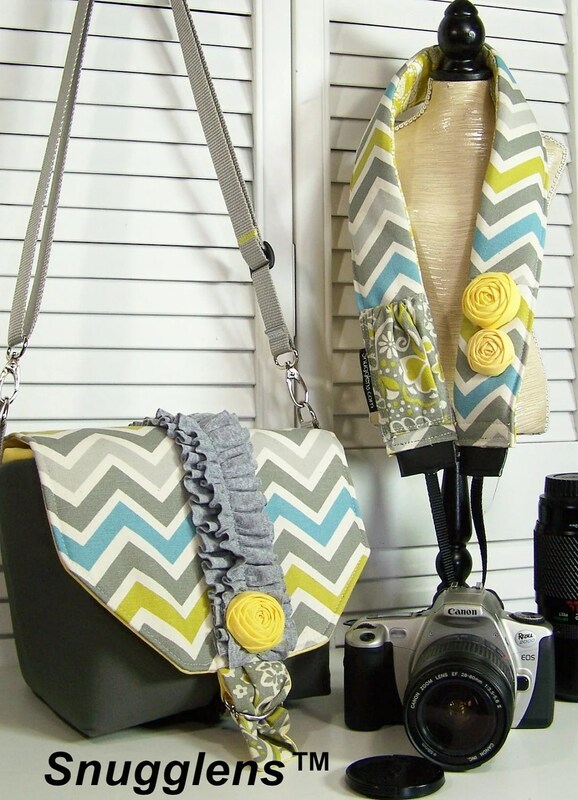 Camera strap with funky designs will make you look great behind the camera. Etsy.com sells a variety from $20 and up. Camera bag, also from Etsy,com, will be functional, and good looking (and could match your strap!). Don’t forget about shipping costs. Finally, to end the list with something really extravagant, the M.Zuiko 75mm f1.8 portrait lens for $900. They say this lens is so good it makes your subject even more good looking. For the moderate spender, Claire says Winners offers a variety of fine high fashion jewelry. But what’s she’s really had her eye on is a rainbow coloured ammolite pendant, and I have to agree that this gemstone is stunning. 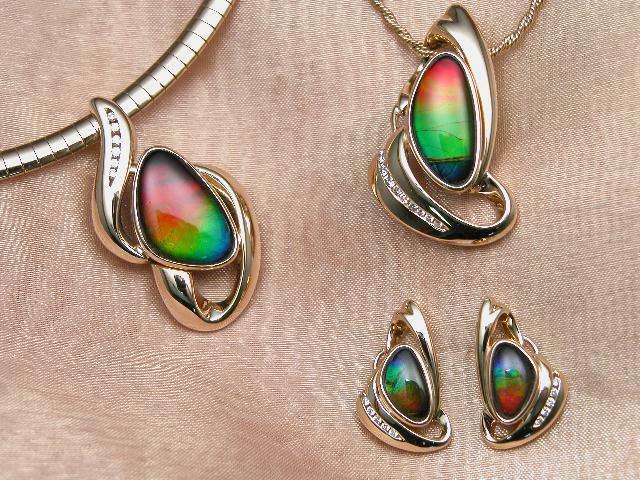 Ammolite is a rare gemstone made of fossilized shells and found in the eastern slopes of the Rocky Mountains. It’s also the official gemstone of Alberta. Haha made you learn! Please don’t let this out, but Claire is secretly infatuated with Hello Kitty and Minion memorabilia, but she feels too old to go overboard. Well, she’s definitely not too old, and I’m pretty sure she’s not alone. Actually I know a-many highly sophisticated ladies who would take delight in something cute. So if a stuffed toy, toque or cell phone case would make her happy, then she should go for it. Hello Kitty toques and mitts by knitwits can be found at Simons at WEM. Minions are everywhere. You’ve got Despicable Me, Despicable Me 2 and Minion Madness, hopefully that will hold you until July 2015 when Minions (the feature film) is released. Maybe Claire can wear her Hello Kitty toque to the premiere. There’s a plethora of toys too, just search Despicable Me at Toys R Us or Walmart. I even found Minion Maker. And for a cute overload, Animal Planet has this amazing show called Too Cute. Dear Young Self, You’re going to love Beer. Hey man, I know you have questions about the way that your life will turn out – stuff like – do you get a jet pack or a hover skateboard board, but I need to talk to you about something that will become near and dear to your heart. Beer. Now I know that on your 18th birthday someone will buy you a Heineken and it will be memorably bland, so much so that you’ll want to avoid beers for many years afterwards. I know that your college beers will be adequate pitchers of Rickard’s Red shared with friends at the University bar, when you should be studying. (It’s ok, enjoy those beers because school and everything works out, since you work as hard as you play.) But there is a whole wonderful world of beer that you don’t want to miss out on. Your first experience with the “craft” beer market was picking up beer from Chateau Louis. The great beers that will be available – like Holsten Festbock, McEwan’s Scotch Ale and Young’s Chocolate Stout – will make you realize that you have been missing something special in your life. Later on, when the rest of North America wakes up, you will have access to all sorts of great beers. So many, in fact, that I will categorize them for you. Lagers are the most common type of beer, and vary from light to dark in taste and colour. Harp (made by Guinness) is the perfect lager light to me. Great flavour without being so hoppy that it hurts. Pilsners are a type of pale lager. 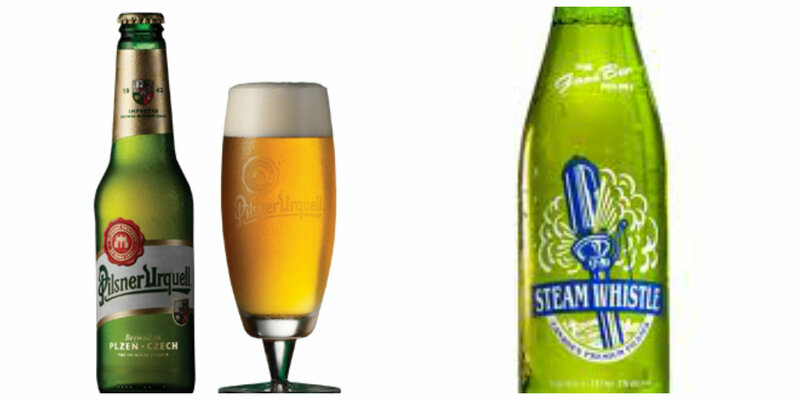 Pilsner Urquell from Prague or Steam Whistle from Toronto. Stouts are the darkest beers in flavour and colour. Cobblestone Stout made by Mill Creek in Scarbourough may be the greatest stout ever. Seriously. I dream about this when I’m awake. It tastes like a warm hug from someone you love. Another great one is St. Ambroise Oatmeal Stout by McAuslan in Montreal. 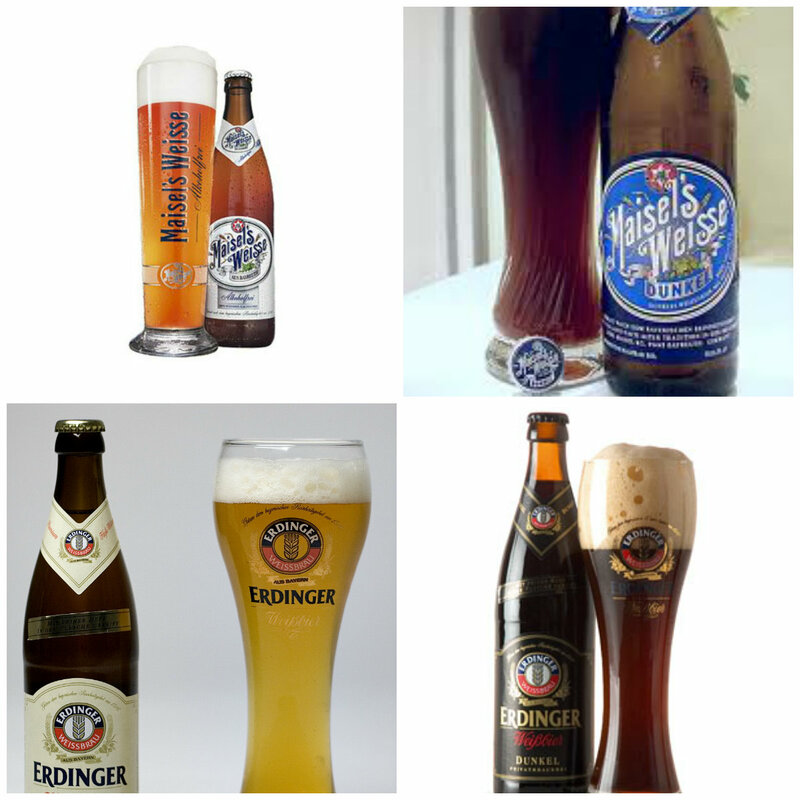 Wheat beer: Maisel Weisse and the Maisel Weisse Dunkel as well as Erdinger and Erdinger Dunkel are fabulous German wheat beers. Add the word “dunkel” to your vocab. It means dark in German. Lambics are a sour type of wheat beer. Now you might not usually like fruit in your beers and Lambics tend to be fruity,but there are some Belgian Lambic Ales that I like St. Bernardus Abt 12. Crabbies is a great ginger beer. You’ll like that spicy ginger taste, and this beer captures that flavour the best. Now, when you are out and about and the bar you are at does not have a great beer selection there are popular beers that you can get in most bars that are actually really good too. 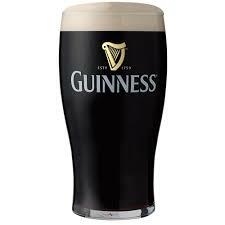 Guinness for example is great and available almost everywhere. For example the Cosmopolitan Music Society, a local community band, rehearses in a building that has a liquor licence and they stock Guinness. Square Foot Gardening – Carrot Success! 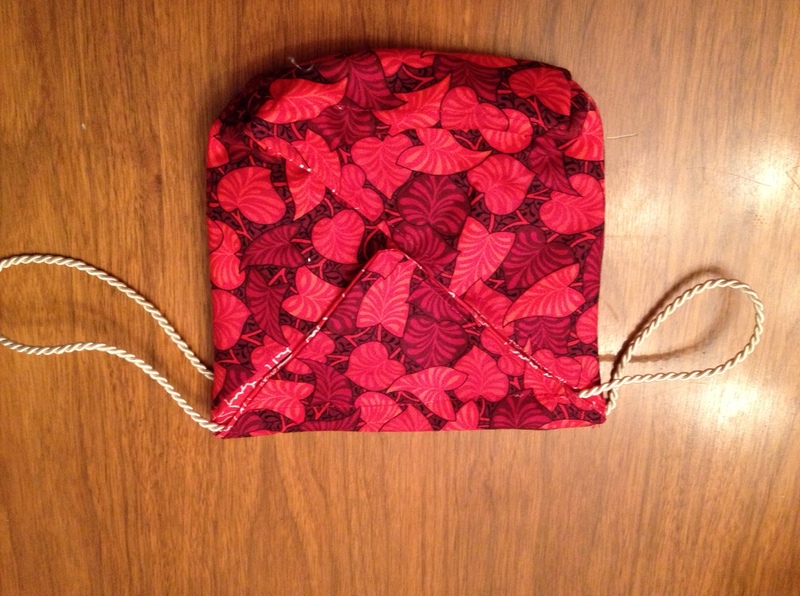 Here’s another great sewing tutorial for a small drawstring purse. I really like the origami-look of it. It is a very well written tutorial with plenty of pictures and is a good project for a novice sewer. I did mine in red and I think it turned out great. It looks almost like the sample! I love bags. No, I don’t mean purses, but bags. I like totes, bags and carry-alls. I like their different designs, functionality, and style. They are also one of my favorite projects to sew because you can use them right away and they don’t need be a perfect fit. 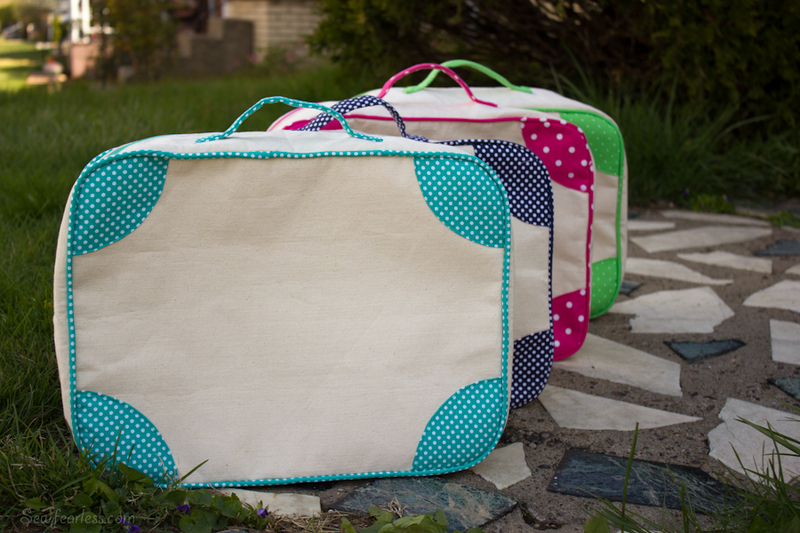 I found this great tutorial on how to sew a sidekick suitcase, meant for a child. It’s a 12-day sew along, and is very detailed with plenty of pictures. Then I found the perfect customer. My dad! He has a new motorcycle and the sidekick suitcase would be perfect for the pannier. He could buy the coordinating bag, but it’s awfully expensive. Plus, the one I make will be so much better, right? This bag was a monster of a project! It was way beyond my pay grade. It took me a few tries and many hours. The first time, I wasn’t precise enough and nothing matched up. It looked awful. The second try went much better, but not perfect. I cut out a lot of the detail to simplify the project. I bought the stiffest interfacing I could find, which cost me $20. Although, I should have used the plastic mesh the writer suggested. I bought the strap for a buck at the dollar store; it was sold as a luggage strap and included the buckle, which the fabric stores sell for $5. I learned that with big projects like this, you must take it slow. Measure carefully, lay everything out, and take your time. I also learned that the bag’s dimensions must be much smaller than the dimensions of the pannier, because when the bag is full it’ll stretch to beyond its intended size. Dad only ended up getting on pannier, because this project was so much work. But the result is pretty good. The bag fits very nicely in the pannier. I stumbled upon this well written and detailed tutorial on how to sew a bow clutch. This is a great tutorial, especially for new sewers. The instructions are fairly straight forward and there are a lot of pictures to make each step very clear. My first attempt was a huge success. 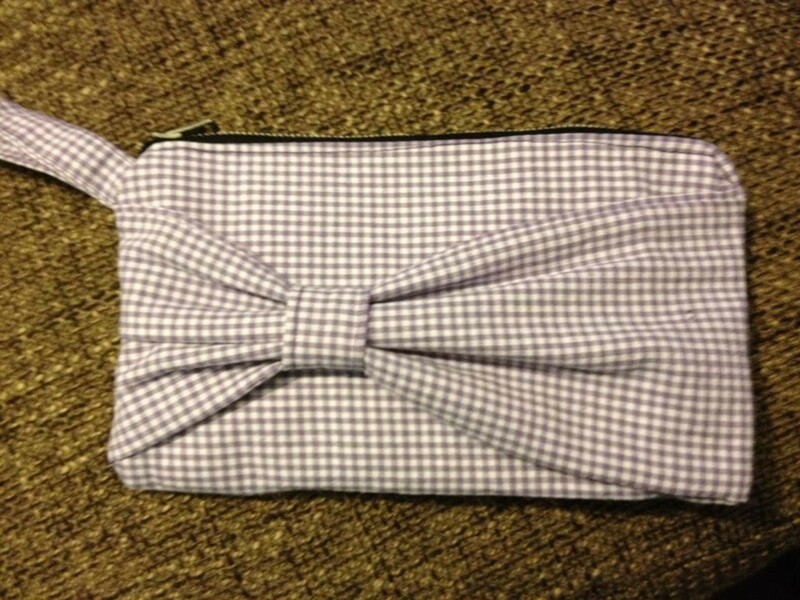 I made this purple gingham purse and it was the first time I sewed a zipper and first time I used interfacing. I couldn’t wait to make some more, so when my friend announced she was getting married I jumped at the chance to sew some purses for her bridesmaids. The wedding colors are apple green, silver and black. 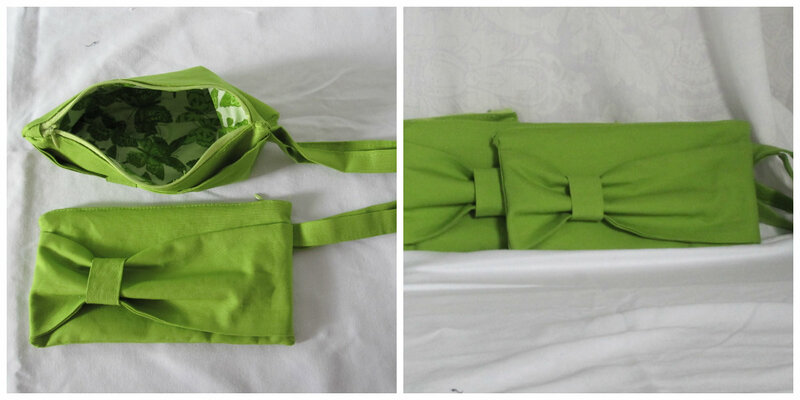 The bridesmaids’ dresses are black and the bride thought apple green purses would be the perfect accent. 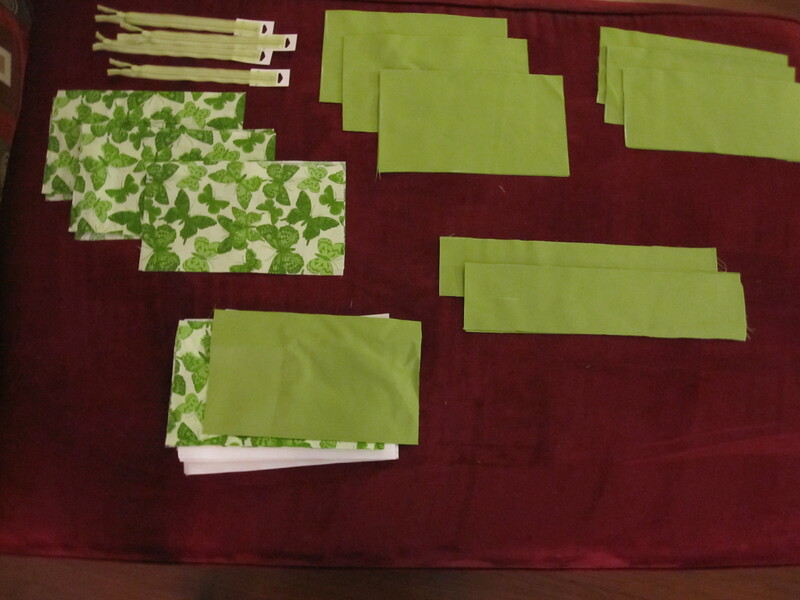 I picked up this fabulous green fabric for the exterior and a cute butterfly pattern for the lining. I love the final product. It’s cute, unique and custom! In early May I was completely gung-ho on my newly built square garden. I planted all my seeds and watered regularly. By early June I noticed that whenever something started to come up, it was quickly gone. Rabbits! So I put up a fence and re-planted. Then we had cold weather and lots of rain, so I took to ignoring my little garden. Today, mid-September, it looks like this. Sad, isn’t it? Of the 18 peas I re-planted, on two grew. 1/36 beans seeds grew, producing about 4 beans. My two pepper plants produced two golf ball sized peppers. The spinach grew straight up, and never had enough leaves to eat. And I never did plant any kale, lettuce or basil. I did get several zucchini plants to grow, and I spread them out into the empty squares. 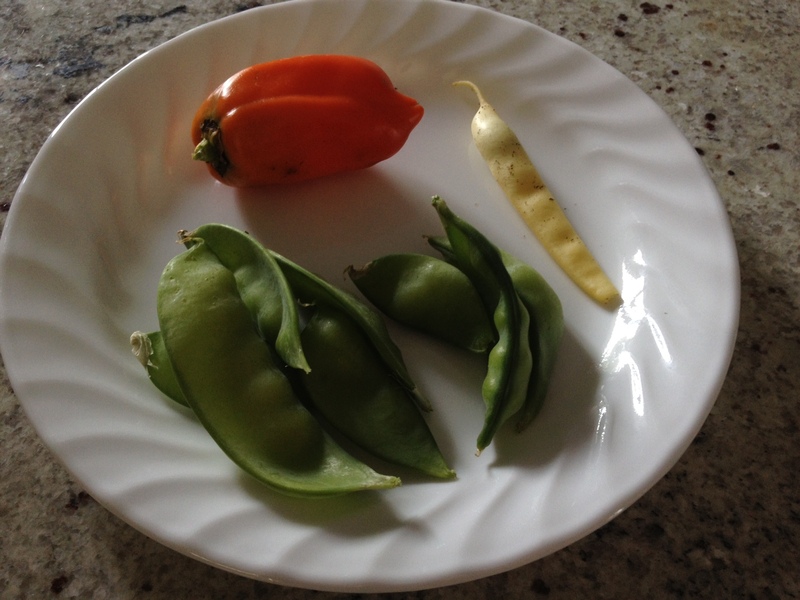 I already picked one fruit, but it was really hard, so I thought I’d let it ripen. It ended up rotting. The only good thing is I seem to have a nice row of carrots. I’ve been inspecting them, and the tops are a fairly decent size. I’m still optimistic that this won’t have been a complete waste. Am I discouraged? Sure. Will I try again? You bet. The nice thing about the garden is it really didn’t get many weeds. And I like having my veggies contained to one small area. Next year I’ll be sure to put up the rabbit fence right away, and if the carrots go well, I might double the area the carrots get. 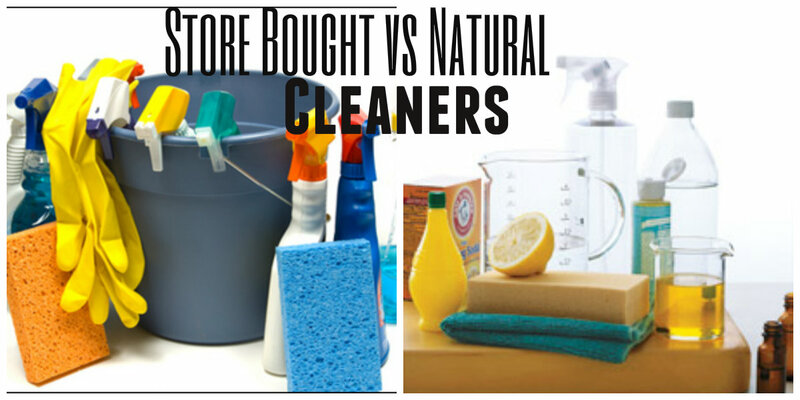 Homemade cleaners sound like such a good idea, right? But do they work as well as the store bought stuff? I decided to test some myself. The first thing I noticed about the brand name is the smell of ammonia. I really don’t like the smell; it’s so “chemically”. But you know what? Ammonia is a naturally occurring. Know what else? It’s an irritant. Don’t breath it in, get it on your skin or in your eyes. I cleaned a few mirrors and windows, and the results were virtually the same. The homemade cleaner did leave a few streaks, but they evaporated away within seconds. The brand name left no streaks and was easier to wipe. Still, I’ll take evaporating streaks over stinky ammonia any day. The brand name said it can clean stainless steel, so I tried both on my fridge. Neither of them worked, I was left with lots of streaks. Verdict: Homemade Glass Cleaner. It doesn’t stink and works great. Ya, I know, I just said I don’t like the smell of ammonia and here I am with ammonia in my homemade cleaner. The thing is, I made these cleaners a while ago and if I were to make it again, I’d find a recipe without ammonia. I cleaned the kitchen sink and the bathroom sink, and both cleaners worked equally well. Then I cleaned the pink slime (did you know that’s mold? It’s called Serratia marcescens) off the shower curtain. The homemade cleaner was hard to scrub because it’s not very slippery and in the end didn’t work. The store bought had nice foam and it’s viscous texture was easy to scrub, the pink stuff came right off. The brand name cleaner I happen to have is Vim Power Pro Naturals. The active ingredients are sodium laureth sulfate (a detergent, surfacant (lowers surface tension of a liquid) and foaming agent) and citric acid (chelating agent, which means it binds to metals, which means it can remove lime scale and hard water stains). Both ingredients are considered “good” to Paula Begoun, who rates chemicals in cosmetics for irritation. She considers ammonia to be “bad”. Verdict: Brand Name Bathroom Cleaner, specifically Vim Power Pro Naturals. The homemade stuff just didn’t cut it, and the brand name ingredients are safe and non-irritating. This one is a no-brainer. For dusting all you need is water to keep the dust from flying away, oil to add sheen, and vinegar’s acidic properties to dissolve minerals and is antibacterial. No need for expensive cleaners for dusting. Verdict: Homemade Dusting Spray. Cheap and it works. Wood polish is supposed to clean and revitalize wood. Use this when the wood is dried out and needs refreshing. I already had great success with a homemade version and you can read all about it here. But I never did a head-to-head test with the store bought version. Well I had two different brands, Pledge Revitalizing Oil with natural orange oil and Orange Glo wood polish. Both had a nice citrus smell, but I don’t really need my furniture to have fake orange smell. The Orange Glo was definitely the worst. It left an ugly dull film. At first the Pledge and homemade looked equally good – the dried out spots were hydrated and the wood had a nice sheen. But the next morning was a different story. The homemade version looked nice but had absorbed all the oil. The Pledge side was still really glossy, beautiful. Pledge has the following ingredients: White mineral oil (safe), diamethicone (non-biodegradable), d limonene (poor, skin irritant), polyglyceryl oleate (avoid contact with skin), fragrance, dye and bitrex. Verdict: Toss Up. Homemade is cheaper, safer, greener. But for serious wood rejuvenation projects, I would opt for Pledge Revitalizing Oil. Baking soda is a mild abrasive. Plus it’s in pancakes, so it’s got to be good, right? The cleaning powder has a whole host of ingredients that are not good eating. Both worked equally well on my kitchen sink. I’ve cleaned my entire bathroom with baking soda and vinegar and have had no problems. vs a dab of oil and a soft clean cloth. It seemed everything I tried left terrible streaks. Then I realized that I didn’t want a cleaner, I wanted a polish. Once the fridge is clean, a little polish is what makes it shine. A dab of oil on a cloth worked just as well as the store bought stainless steel polish. Save money, save space, save time – use homemade. Verdict: Homemade Stainless Steel Polish. Works just as well. Drains aren’t usually a problem until they’re a problem. I usually start at the simplest remedy and work my way up to more serious solutions until one of them works. Grossness Warning! If it’s hair down the drain, the easiest way to clean it is manually with something to pull up the gunk. Yuck! But nothing works better or is greener than fishing it out with a coat hanger. If it’s further down, try the following from weakest to strongest. 3. Drano – Uses lye to dissolve organic matter. Lye is corrosive and can burn your skin. Remember Fight Club? So be careful. When we had just finished our kitchen reno, the kitchen sink started to drain really slow. I tried all of the solutions above and nothing worked until we finally got a plumber to come look at it. It turns out that our tiler was pouring grout and sand down the drain . Our pipes were full of bits of tile and grout. Bleh. Can I recommend a plumber? Yup. Can I recommend a tiler? Sorry. A note on vinegar – Vinegar’s acidic properties can dissolve mineral deposits from glass and stainless steel and can polish brass and bronze. Plus it’s anti-bacterial. 5% vinegar is 90% effective against mold and 99.9% effective against bacteria. So why wouldn’t you use it? You can pretty much clean your entire house with some vinegar, oil, baking soda and a couple of spray bottles. Use a dab of oil on a clean cloth to polish stainless steel surfaces. This birdhouse was old when my parents bought their house 27 years ago. Every year the sparrows come and make it their home and my mom watches their activities from her dining room. But the fence that the birdhouse is attached to is set to be demolished. 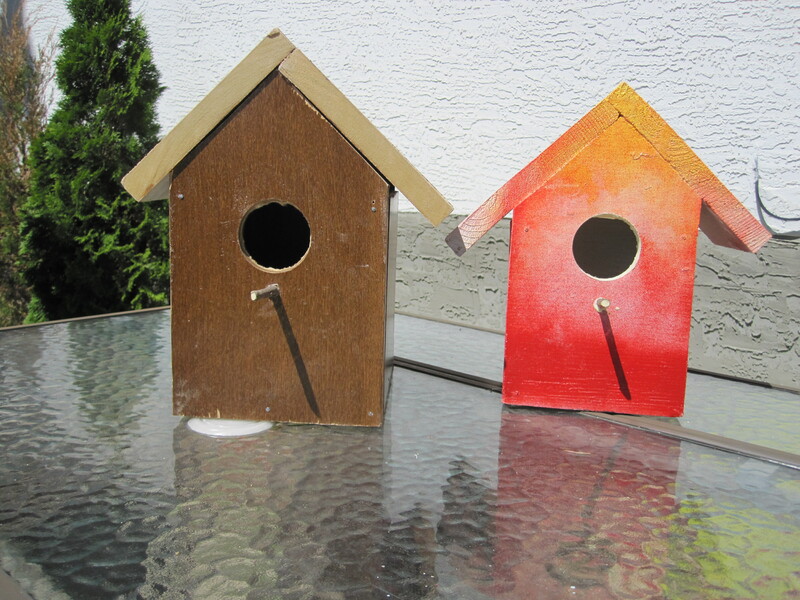 So, I decided this would be a good chance for me to build a new birdhouse. I salvaged a nice wide board from the demolition of another part of the fence, and I followed the gist of this video tutorial. First, hinge one of the walls with nails and close with a screw. This makes it easy to clean out every year. Second, cut the corners off the base. This allows for drainage. Lastly, make the side walls a 1/2 inch shorter than the main walls so it leaves a little gap under the roof. This allows for airflow. First, draw out your cut lines. If you don’t have a square, you can use a little math to draw the peaks on your main walls. Since the peak is an equilateral triangle, and the width is 6″, then a 12″ X (two times the width) on your board will give you two equilateral peaks that face each other. Cut all four corners off the floor. This will allow drainage in the house. Cut some grooves on the inside of the main wall below where the entrance will be. The birds will like this rough wood to grip with their claws. 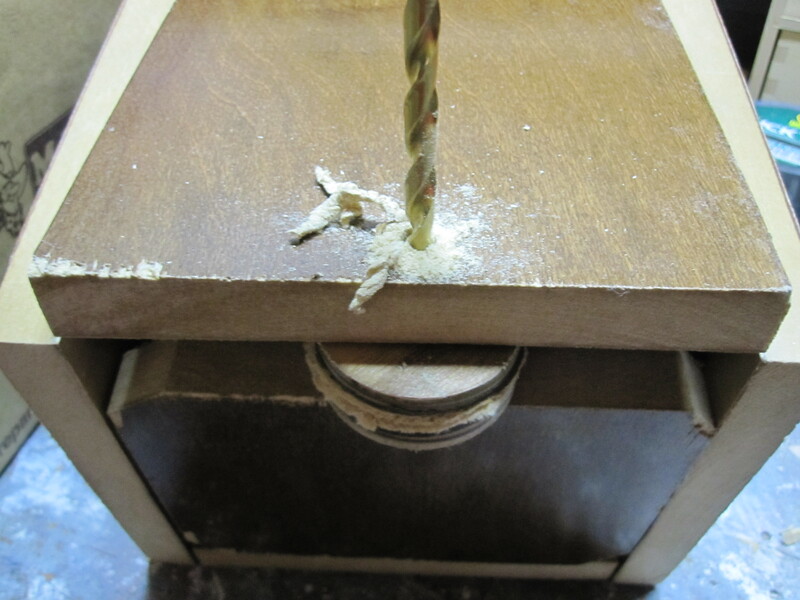 Use a hole saw bit and drill a hole for the entrance. This was a little bit of work and I saw smoke. Be patient. Drill a hole for the perch. Assemble the walls around the floor. Pick one Side Wall and only put a nail on each of the top corners. Don’t put nails on the bottom corners. See how the one Side Wall swings up like a DeLorean door? That’s so we can easily clean it out at the end of the season. We’ll secure it soon. Nail in the floor. Don’t forget to leave that DeLorean door swingable. Add the roof. Now, if I were smart, I would have made one side of the roof longer than the other side by the thickness of the board. I hope that made sense. Except, I can’t cut a 6″ wide board to make a piece that’s 7″x7 5/8″. So the roof is uneven. I hope the birds don’t mind. Now, to secure that DeLorean door. I drilled a hole into the door only, not the floor, and made it wider than my screw. Then I popped in the screw and hand screwed it into the floor. So when I do need to clean out the house, I just need a screwdriver to pop in the screw.